Mildew can be found almost anywhere. It can be found both inside and outside homes. Both mildew and mold are types of fungi. Mildew tends to have linear growth and mold will grow structurally with multicellular filaments. If you have either of them (or both) you want to get rid of them. It is easy to do! Both of them are easily killed with sodium hypochlorite (bleach). On exterior structures I recommend using a hudson sprayer (garden sprayer) and use a diluted bleach solution on it. I normally use about a cup of bleach to a gallon of water. It is a good idea to spray down the surrounding area with water prior to using the bleach solution. Spray plants, decking etc. After you have sprayed the affected area wait about ten minutes and then spray well with water. You will want to respray the area around the affected area again as well. When you have a problem on the inside of your home it is the same process only you have to be more controlled about the spraying. Any area that can be damaged by the bleach solution will need to be protected and you will need to be careful with the spray pattern. If the areas are still structurally sound then they can simply be repainted when dry. 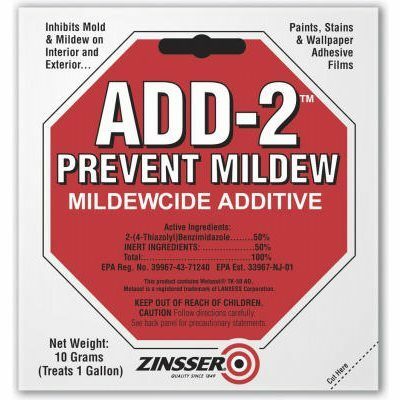 I recommend using a mildewcide additive to the paint.